This season will best be remembered as the year Southport first assumed their role of giant -killers. After the debacle of the previous season the Directors appointed Charles Parker as Secretary-Manager-he had just completed eight years as Secretary of Preston North End—and wisely re-engaged Frank Jefferis as trainer-coach. The side was built around two Welsh Internationals—Harry Beadles, a free-scoring inside-forward from Sheffield Wednesday, and Jack Newnes, a centre-half from Nelson. 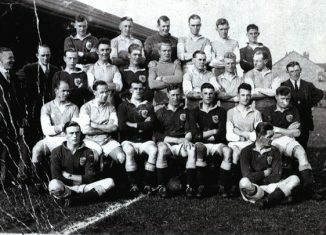 Despite a poor start to the season during which time “Topping” Sinclair was absent owing to a dispute with the club over terms, the team eventually settled down; Wrexham were defeated 6-0 with Sapsford scoring four and Beadles two, New Brighton were thrashed 7-2 with both Marshall and Beadles hitting hat-tricks, and Walsall were beaten 6-1, Beadles again scoring three goals. In all, 80 League goals were scored, and Southport finished in a comfortable 12th position; but it was in the F.A. Cup Competition that the club really hit the headlines, progressing further than ever before and netting E2.000 in the process. They were lucky to draw with Tranmere Rovers at Haig Avenue in the first round—George Sapsford scoring a late equaliser. However, the ‘Port played splendidly in the replay at Prenton Park. Beadles opened the scoring with a beautiful header and George Jones seated the victory with a brilliant goal. Crook Town were easily accounted for in the second round at Haig Avenue, and the third round draw paired Southport with First Division Blackburn Rovers. Southport had an old score to settle with the Rovers, as they had knocked out the ‘Port five years earlier. Blackburn. a side with a great Cup tradition fell at their first hurdle; first young Tommy Wnite-schoolboy star of the early ‘twenties—surprised the experienced Sewell, Blackburn’s goalkeeper, to put Southport ahead and then, after the interval, Beadles scored the second. Unfortunately, an injury prevented Beadles from taking part in the fourth round tie, when Southport finally met their match, losing 3-1 at Anfield in front of 51,6,10 (receipts £3,200) which still remains the highest crowd before which they have played. Southport appeared overawed by the occasion, and were well beaten on the day: had Liverpool’s shooting not been so wayward the score would have been higher still. The team which faced Liverpool was: Halsall; Allan, Glover: Sinclair, Newnes, Bimson; Jones (G. W.). Marshall, Bradley, Sapsford and White. Shortly afterwards Tom White was transferred to Everton, where he enjoyed great success. helping Everton to two championships and gaining a cup-winner’s medal and an England Cap against Northern Ireland. The substantial fee received for him and the good Cup run resulted in Southport recording a profit of over £1.300 on the year.